I was skimming through the shows on TV the other night when I saw a show about hoarders – people that, for whatever reason, cannot get rid of anything. Inevitably this leads to a home full to the rafters with “stuff”. This left me thinking about some of the warehouses I have dealt with over the years with the same problem. Again, for whatever reason, management just cannot authorize the disposal of dead, obsolete or slow moving stock. Inevitably this leads to very full warehouses and inefficiencies in material handling. I knew one company that had material still in their warehouse that had been there for over 30 years and another company that, while moving material from a wall discovered a door into a room everyone had forgotten about. The room had some inventory in it and parts for machines that had been decommissioned decades earlier. These may be extreme examples but they do exist. In talks with various management groups the usual justification is that they had already written off the value therefore it was not costing them anything to keep the material. While it is quite true that there would be no cost on the books, there ARE a number of indirect costs that are incurred by keeping unnecessary stock around. First and foremost, it is CLUTTER and it has been well established (particularly by lean proponents) that clutter leads to lost material, excess movement, longer lead times, and decreasing customer service levels. All these are costs to the organization. Removing this material from the warehouse increases your available space and therefore your available capacity. Your people need to work around the material to get at the material they truly need which slows them down. This does not even consider the extra time taken during any physical inventories to recount what is essentially dead stock. Having clutter in a warehouse is also detrimental to employee attitude in that clutter naturally encourages messiness (lack of space if no other reason) and people that work in a messy environment tend to develop messy habits that lead to a general lack of follow through on the discipline needed to go that extra mile for things like customer service and proper inventory accuracy. ANYTHING that negatively impacts on inventory accuracy will, in the long run, cost the company a significant amount of money just trying to fix it and work around the issues created by incorrect inventory quantities. Invariably poor inventory accuracy leads to larger, just in case, inventory levels which absorbs warehouse capacity leading to an even messier environment and eventually to a requirement for a larger warehouse and more people. Sadly, this requirement is perfectly justifiable based on the inventory that must be kept in order to ensure no stock outs for either production or customers. Are we getting the picture here? In our personal lives most of us are very comfortable that we are not hoarders… but how easy is it to park your car in your garage? 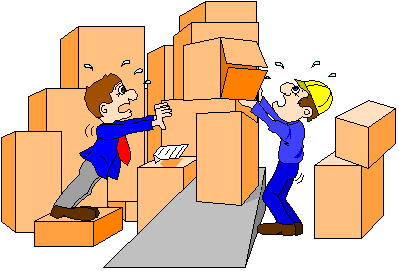 Do you have boxes piled up against the walls in your basement? Do all your clothes fit in one closet and is there anything there that you have not worn for more than two years? Are you sure you are not a hoarder (or at least a hoarder in training)? But, you can justify everything extra that you have laying around the house as “just in case”. Are you applying the same mind set at work? In the end always remember that the only reason for having inventory is if it is cheaper to have than to not have. Anything else should be gotten rid of. While just a general good clean out might work, you might want to look at, implement, apply the principles of 5S to the issue. 5S is a standard tool in Lean Thinking that can easily be applied in not only a production environment but also in an office, warehouse or even at home. Even if you are sure you have no clutter laying around you might be surprised what a 5S audit would turn up. Think about it, it may be one of the cheapest cost savings and efficiency improvement tools you ever implement. Having issues with your inventory? Always remember that inventory is a symptom not a cause. You have inventory because of issues with your processes and removing excess or dead inventory IS a process, one that many companies are not particularly proficient at. Again, in the end, the only reason to have inventory is when it is cheaper to have it than to not have it. Do you have excess inventory and do you understand the harm this is doing to your bottom line? Do you need help understanding and getting control of your inventory? Contact Ed White at Jade Trillium Consulting to discuss whether we can help your organization and how best to proceed. Hope you enjoyed this posting. Talk to your friends and co-workers about their experience and thoughts on this topic, especially what it means for your organization. And, as always, I would love to hear back on your (and their) thoughts. Just fill in the comment box below along with your contact information to let me know what you think. « DOES YOUR INVENTORY FLOW LIKE WATER?